Great sandwich to send for lunches or a quick dinner! 1. Cut onion into 1/4-inch (5 mm) thick rings. In skillet, melt butter over medium heat; cook onion and half each of the salt and pepper until softened, about 8 minutes. 2. In large bowl, combine maple syrup, mustard, and remaining salt and pepper; set aside. 3. In nonstick skillet, heat half of the oil over medium-high heat; cook bacon, in batches and adding more oil if necessary, turning once, until tender and golden, about 4 minutes. Cut each slice into 4 pieces. Add to maple mixture; toss to coat. 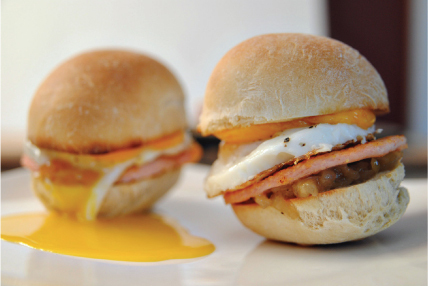 ** Special treat, cook one of our Brooker's Farm Fresh eggs and top your Peameal Slider with an over medium egg for a taste combination to die for!